The Sept-2014 edition of Elektor introduced the T-Board to its readers. In the accompanying article, I walked through the key features of the board and showed how to get an Atmel ATmega328 blinking an LED. 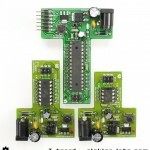 The article was well received, and the board sold like hot-cakes from the Elektor store. It seemed that many hobbyists were in the same boat as me, and wanted to get their hands dirty working with bare-metal microcontrollers. There was certainly more information that could be shared, so we worked on a webinar with Element 14. The webinar was recorded, so you can see how the T-Boards are leaner and meaner than Arduino. It was great to work with Elektor again, and take the reader through a series of experiments to reduce the power consumption of an AVR project. Compared to a standard Arduino UNO, we reduced the power consumption for a temperature logger by over 98%. This project uses the T-Board 28 with an ATmega328, along with Atmel Studio. Check out the Dec 2014 edition of Elektor magazine to see how we did it. Please get in touch with me to share your embedded projects, and what you might want to see next.